The mother of 28-year-old Jennifer Judith González Méndez, reported her daughter missing on Monday. The young woman is 1.69 metres tall, slim and has medium-length, chestnut brown hair. The curious thing about this missing person's report is that the young woman was last seen on July 20 last year. She lived with her boyfriend in the La Cuesta district of La Laguna. But he doesn't know where Jennifer is either. 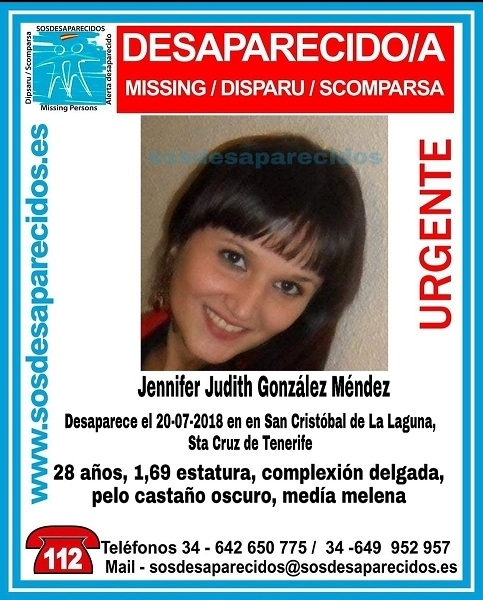 "It seems she disappeared overnight, but nobody reported her missing," explained Santiago Carlos Martín, coordinator of SOS Desaparecidos in the Canaries. The young woman had moved out and made herself independent. That's why her mother hadn't noticed until now that her daughter had disappeared. Girlfriends had not heard from her either. Produced with news.CMS in 0,0633 seconds.